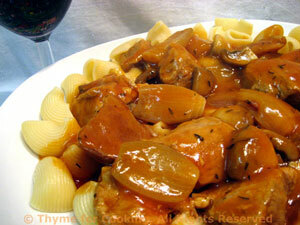 Veal Marengo with Pasta, Thyme for Cooking main course with an Italian twist. This can be cooked in the 90 minutes allotted or left to simmer for a couple of hours if that works into your schedule better. You can serve it over gnocchi, pasta or egg noodles. I'm using pasta. Unlike a lot of Italian sauces, this is very light on tomatoes, just enough for some flavor. Cut veal into 1 1/2 inch (4cm) cubes. In a deep, heavy pan heat the oil over medium-high heat. Add the veal and brown on all sides. Add garlic, tomato paste, stock, wine, bouquet garni and thyme and bring to a boil. Cover and reduce heat to low. Simmer for 45 minutes. Clean mushrooms. If mushrooms are large cut in half or quarters. Melt butter in a nonstick skillet over medium-high heat. Add shallots and sauté until starting to brown, about 5 minutes. Add mushrooms and sauté another 5 minutes, stirring often. After the veal has simmered for 45 minutes add the shallots and mushrooms and simmer another 30 minutes or until vegetables are done. With a slotted spoon remove the meat and vegetables to a serving dish. Cover to keep warm. Turn the heat to medium-high under the sauce. Give the cornstarch mixture a stir and add to the sauce a little at a time until thickened to your liking. Spoon over the meat and vegetables and serve over gnocchi or pasta.